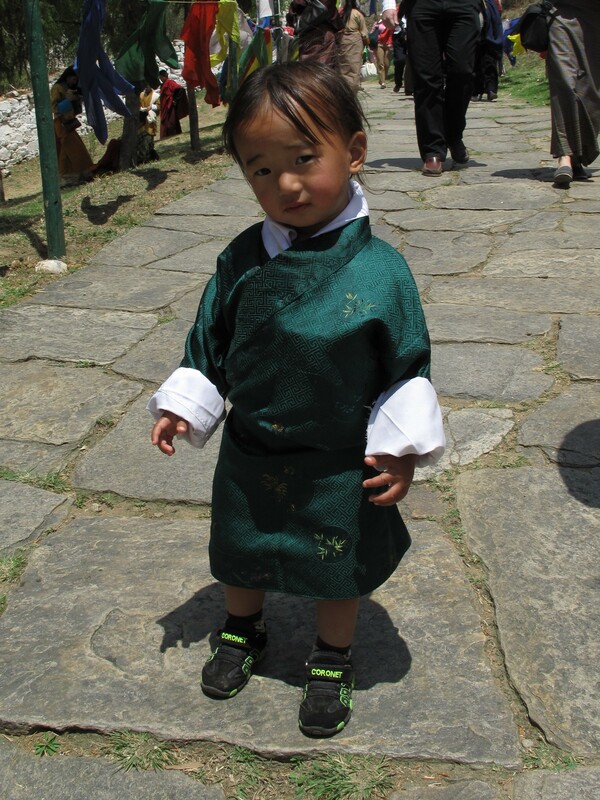 Feeling settled into life in Thimphu, it was time to set off on our first weekend out of the city. 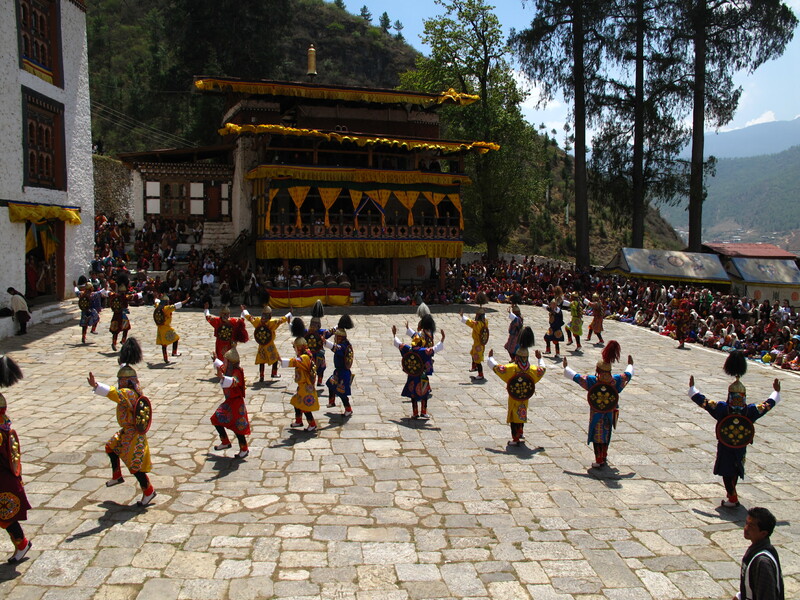 The Dzong in the town of Paro, 1.5 hours drive west (where the airport is located), was having its annual festival. One of the other Australian volunteers lives in a village just outside of Paro so we went to stay with her for the weekend. 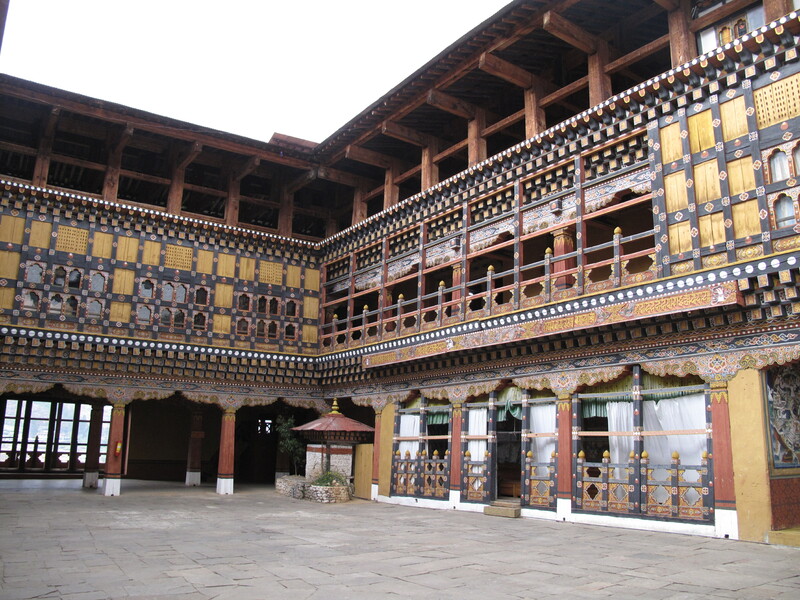 As I mentioned in a previous post, a Dzong is essentially the administrative and religious ‘head quarters’ for a municipality. It’s almost like the Town Hall, but uniquely Bhutanese in that the government offices and the Buddhist monastery coexist within the same complex. 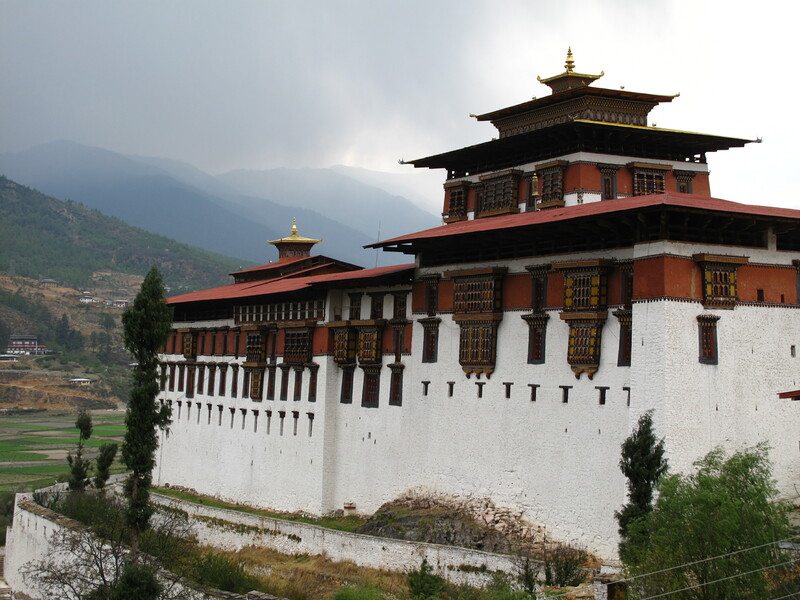 The Dzong is usually a grand imposing fortress with golden roofs and an ornately decorated interior of painted frescoes. 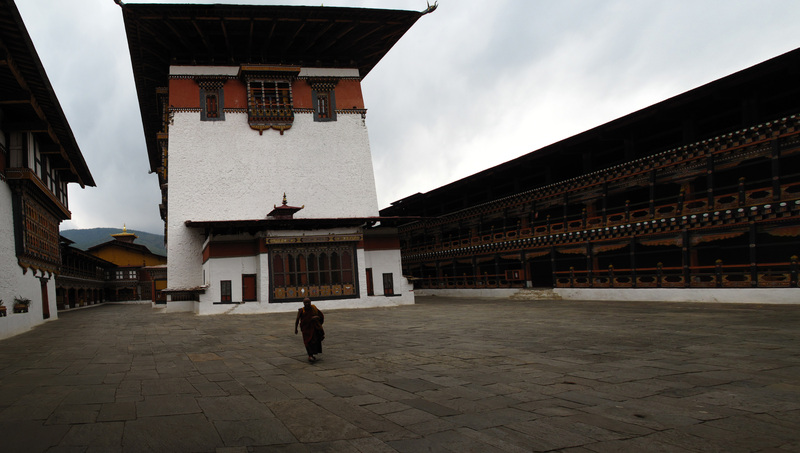 Each Dzong has an annual festival, known as “Tsechu” which centres around Buddhist beliefs and rituals. 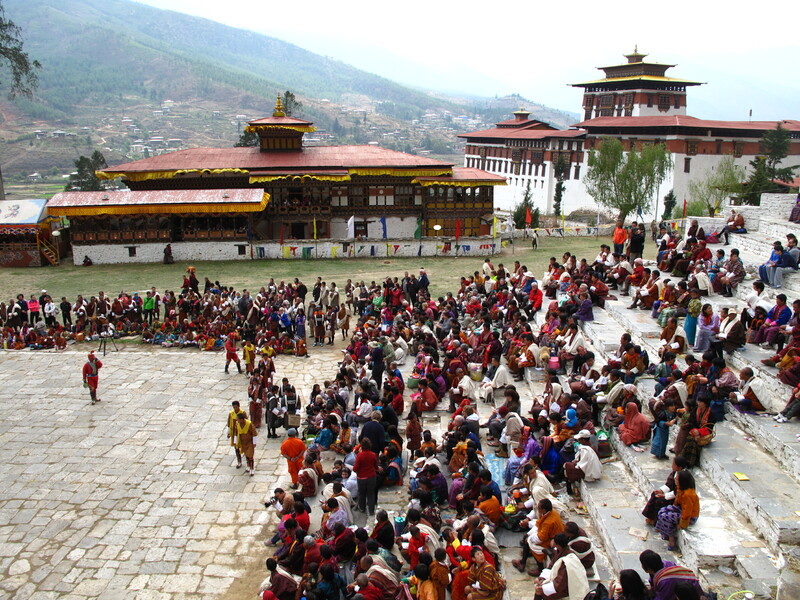 Sometimes a Dzong might incorporate a festival ground where the action takes place. When we asked our taxi driver what he enjoyed most about the festival, he answered “It’s not what we enjoy or don’t enjoy, it is about preparing ourselves for death and reincarnation”. In other words, it is not just a fun social gathering with friends but a serious religious observance. 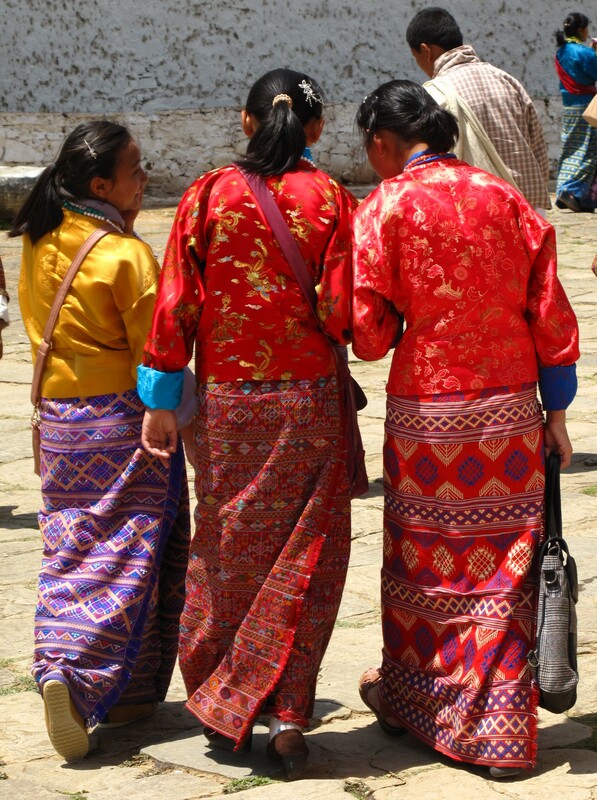 It is customary to dress in your best Gho’s / Kira’s to attend the Tsechu, and we certainly saw some beautiful outfits. There always seemed to be a local on hand willing to assist a foreigner who is visibly struggling with their outfit or has tied something the wrong way. When we arrived at our friend’s house, her neighbour re-dressed Jordi in his Gho (I tried to watch and learn although she did it so quickly and adeptly!). Then when we arrived in the carpark at the base of the Dzong, Jordi was having trouble tying his Kabney (the white scarf required when entering a Dzong). Two Policemen and two taxi drivers emerged from nowhere to assist! But despite their best efforts, the Kabney had managed to unravel itself by the time he reached the festival ground, but nevermind, the Community Police were on hand to fix him up! To reach the festival ground of Paro Dzong, we crossed the footbridge over the river and followed the crowds walking up the stone path, lined with coloured flags, that zig-zagged up the hillside. The festival ground is located on a flat area, looking back across the rooftops of the main Dzong building and the valley below. It is a large square paved area where the dancers perform surrounded with built structures on 3 sides. On the southern side is the building for the musicians, on the eastern side a building for the dancers, and on the northern side a stepped area for the audience to sit and observe the performances. The sacred masked dances are performed by the men and the choreography and the costumes all hold sacred significance. It is said that the moves are not ‘choreographed’ as such, but re-enacted from a vision that a Buddhist Guru saw during a deep meditation. The elaborate masks and costumes are external representations of internal qualities such as wisdom, compassion and wrath each with a moral story attached, or animals representing life after death. The masked dances usually alternate with the folk dances performed by the women. And during the entire festivities 4 men dressed all in red with phallic symbols on their heads provided comic relief by mimicking the dancers and performing slapstick routines! It was great to get out of the city for a while and explore some of the Bhutanese countryside. 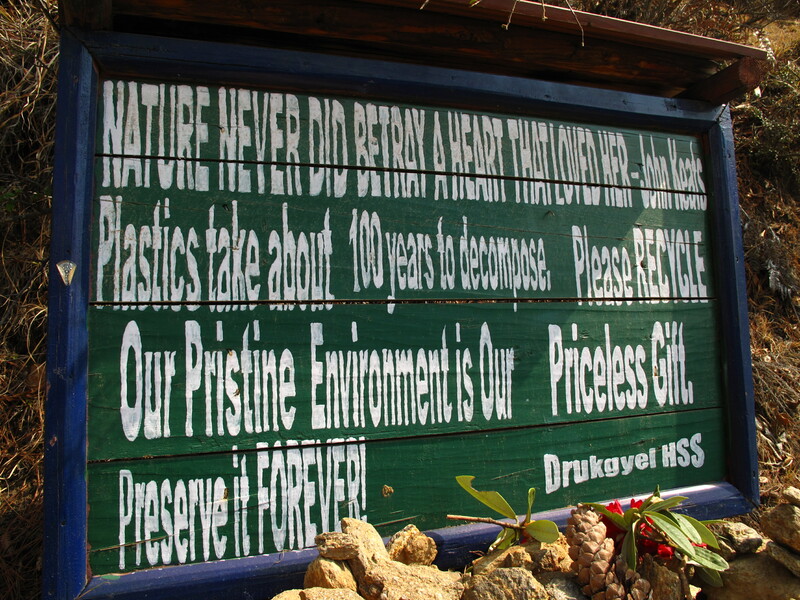 Drukgyel, where we were staying, is a small rural farming community. We went wandering along the farm roads past traditional farm houses in various stages of construction and fallowed fields ready for planting. I’m always impressed with rice terraces, but being used to seeing them in the Philippines, Vietnam and Indonesia fringed with coconut palms, there was something quite intriguing about seeing them here surrounded by pine trees and snow-capped mountains. If it wasn’t for the rice terraces, you could be forgiven for thinking you were in Switzerland. 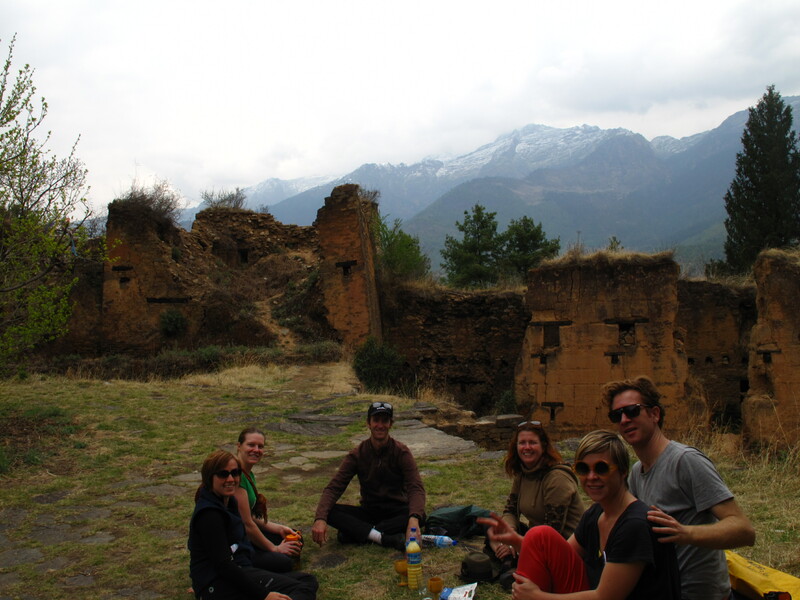 We ended up at the ruins of the former Drukgyel Dzong which had been built in the mid 1600’s and named in honour of the victory of Bhutan over Tibetan invaders. 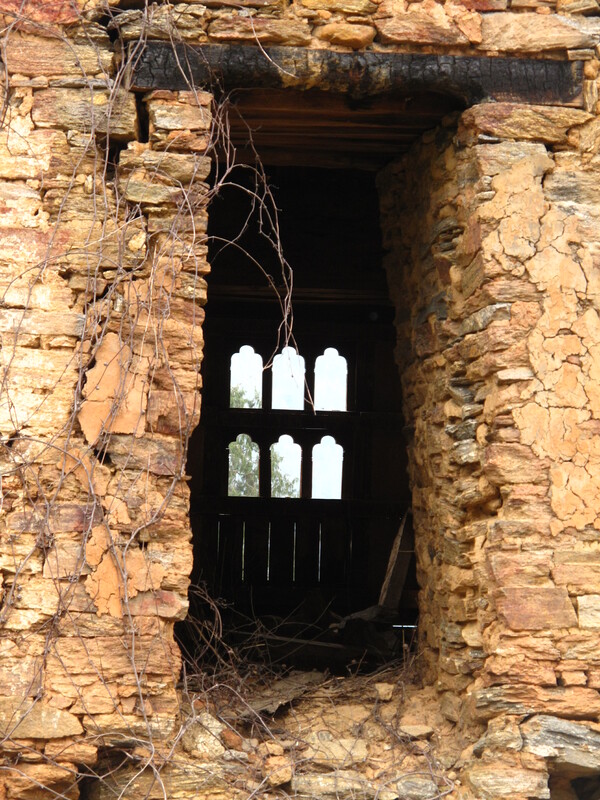 It has not been used since it largely burned down in 1951. The ruins however, made for a great picnic spot. 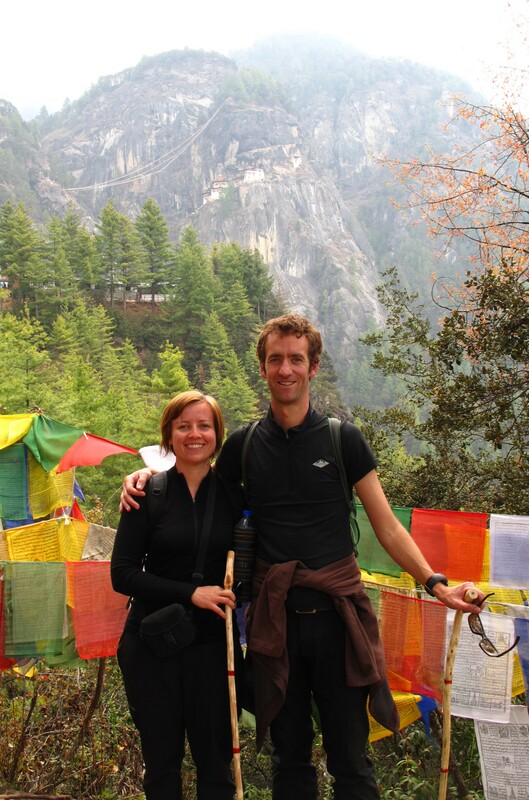 While we were in this corner of the country, we took the opportunity to do what is probably Bhutan’s most popular hike to its most photographed monastery, “Taksang” (or Tiger’s Nest). And sure enough, it was crowded with “Chillups” (foreigners), but despite the crowds it was a fantastic walk. After 2 hours of steady climbing, the reward is an incredible monastery, seeming to defy gravity as it clings to the cliff face. 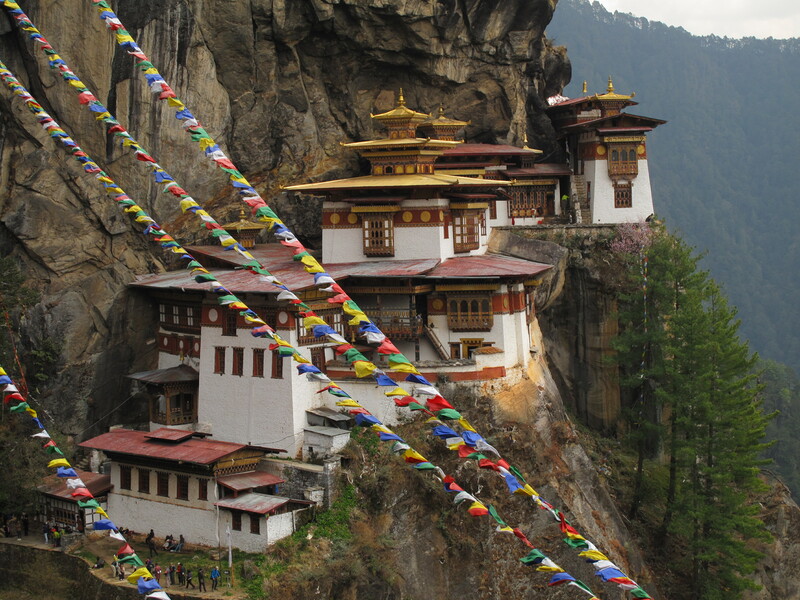 This monastery was built in this location and named “Tiger’s Nest” because legend has it that Guru Rinpoche flew here on the back of a Tigress and meditated in the cave for 3 years. 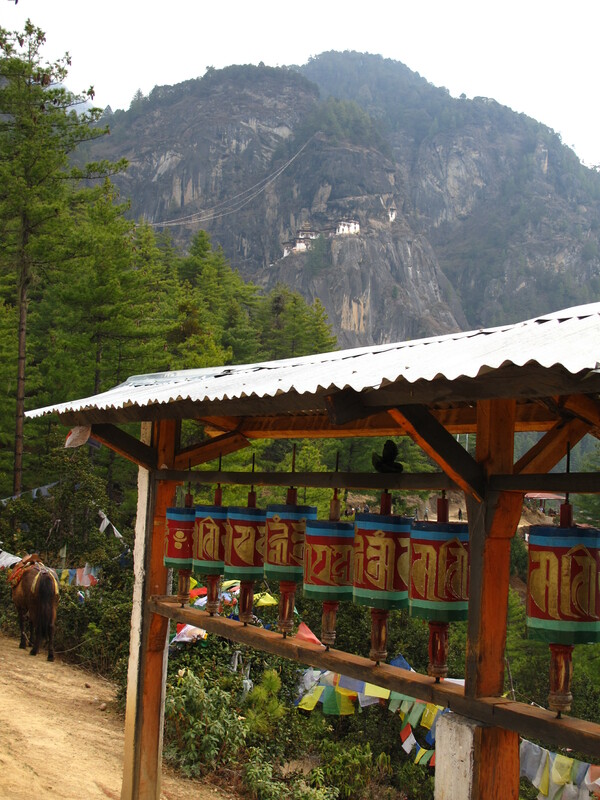 Guru Rinpoche is a hugely revered figure in Bhutan (considered the 2nd Buddha by Bhutanese) as he is the one who is recognised as bringing Buddhism to Bhutan in the 8th Century. 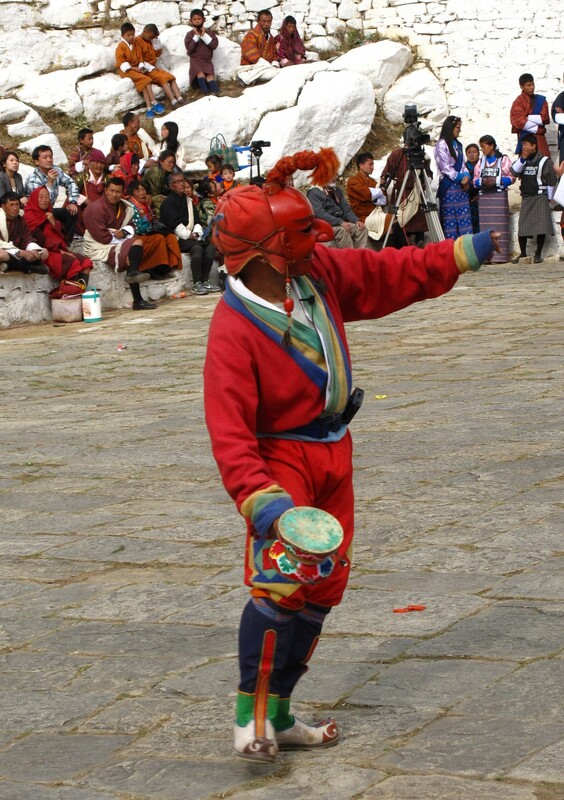 Most of the dances during a Tsechu are also in honour of him. 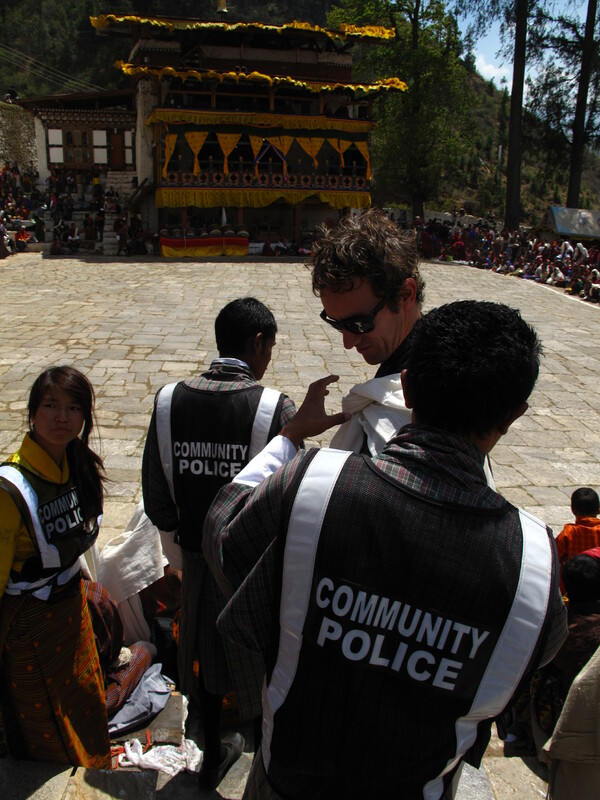 Unfortunately we missed the grand finale of the Festival as we had to return to Thimphu. The big event that happens on the last day of Tsechu is the unveiling of the “Thondrol” – a huge ancient sacred tapestry depicting Guru Rinpoche. It is only on view in the early hours of the morning, and rolled back up before the sun’s rays have any chance of fading it. It is believed that by viewing this relic one’s sins are washed away. Hopefully we will have the opportunity to witness this spectacle at one of the many other Tsechu’s around the country that occur at various times of the year. 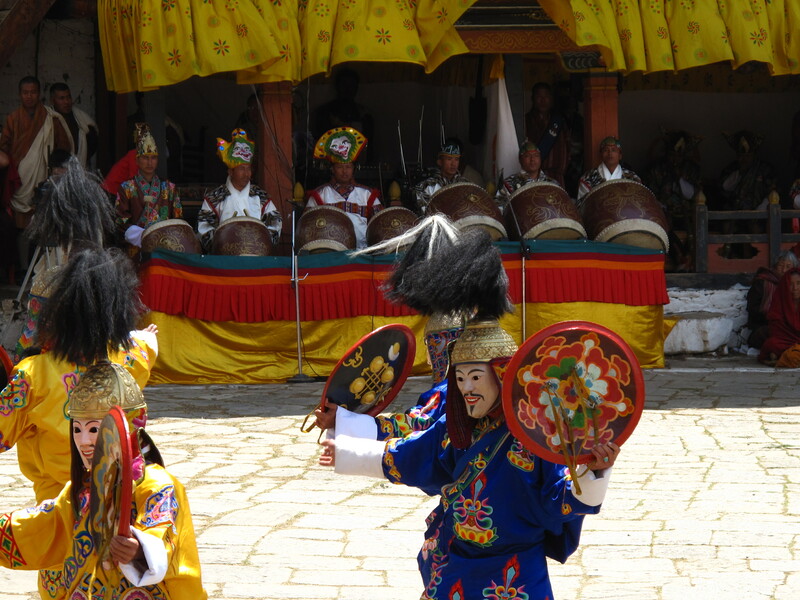 This Post was tagged Bhutan, Bhutanese National Dress, Buddhist festival, Drukgyel Dzong, Festival, Fortress, Gho, Kira, mask dances, masked dancers, monastery, Paro Dzong, Paro Tsechu, rice terraces, sacred, Takshang, Tiger's Nest, Tsechu. Bookmark the permalink. 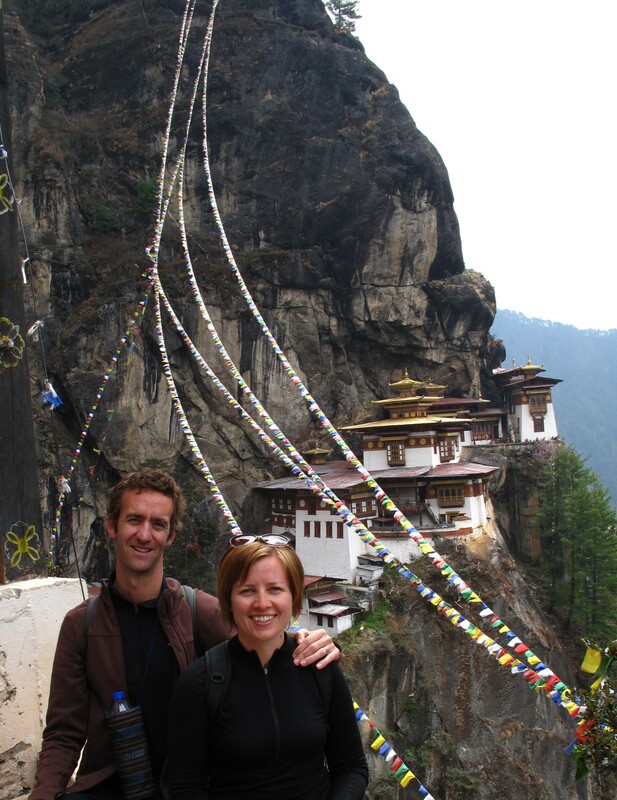 Thanks again Jen for this minitrip through Bhutan. I loved the picture of Jordi being looked after by Police for the proper dressing of his scarf. Bisous.